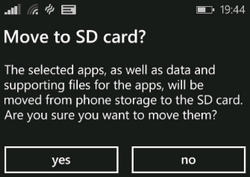 This tutorial will show you step by step how to move installed apps, games, videos, music, pictures, and downloaded files to SD card on a Windows Phone 8 and 8.1 smartphone (e.g., Nokia and Microsoft Lumia). And also how to save your applications, games, files and data to SD card automatically. This tutorial should work for all Windows Phone 8 and 8.1 smartphones, such as the Nokia and Microsoft Lumia 435, 520, 530, 532, 535, 550, 620, 625, 630, 635, 638, 640, 650, 720, 730, 735, 830, 920, 925, 930, 950, 950 XL, 1020, 1320, 1520, and all other types. Your phone's internal memory is the default location where applications, games, videos, music, photos, and downloads are saved and stored. If your smartphone has an internal memory with only a few GB, then your phone's internal memory will be full very quickly. That's why most people use a (micro) SD card in their smartphone and move most of their applications, games and data to the SD card. You can find Storage Sense in the applications list and in settings. 4. Tap on the select icon (circle with small check marks and lines inside) located at the bottom. 5. Select the app(s) and game(s) you want to move to your SD card. 6. Tap on move located at the bottom right. Now your app(s) and game(s) will be moved to your SD card. The easiest and quickest method is by using Microsoft's Files application. Microsoft's Files application is a free application for managing files on your Windows Phone. This application makes organizing your videos, music, documents, pictures, and other files easily. What I like about this application is that you can easily see which files are stored on your phone's internal memory and which files are stored on your SD card. This makes moving files easy. 3. 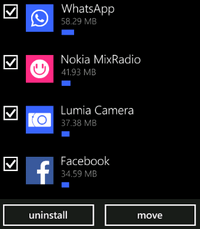 Install Files by Microsoft Corporation on your phone. You can also find Microsoft's Files app here (Windows Store). 4. Open the Files application. 6. Tap on the file type's folder like Documents, Downloads, Music, Pictures or Videos. 7. If you want to move pictures, then open a folder or album. 8. Tap on the select icon (circle with small check marks and lines inside) located at the bottom. 9. Select all the files you want to move. Note: If you want to move all files at once, then tap on the three dots located at the bottom right and choose select all files. 10. Tap on the arrow + folder icon (move to) located at the bottom. 11. Tap on the small home or house icon located at the top left. 12. Tap on SD Card. 13. Tap on the file type's folder (where you want to store the files) on your SD card, like Documents, Downloads, Music, Pictures or Videos. 14. If you are moving photos, then open the folder or photo album where you want to store your photos. 15. Tap on move here located at the bottom left. Now the files will be moved to your SD card. 2. Go to Change where you store your music, photos, apps, and more. 3. 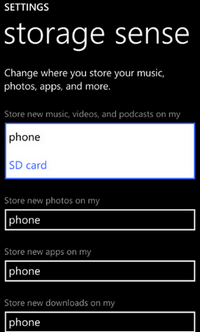 Tap on phone located under Store new music, videos, and podcasts on my and choose SD Card from the pop-up menu. 4. Tap on phone located under Store new photos on my and choose SD Card from the pop-up menu. 5. Tap on phone located under Store new apps on my and choose SD Card from the pop-up menu. 6. Tap on phone located under Store new downloads on my and choose SD Card from the pop-up menu. The selected items will now be stored on your SD card automatically.